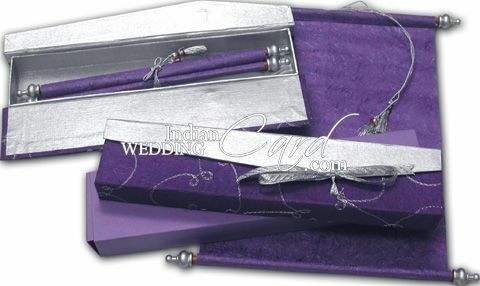 S45, Purple Color, Handmade Paper, Scroll Invitations, Jewish Invitations, Box Scrolls. 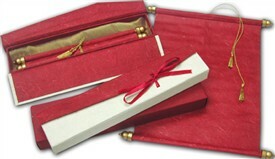 A piece of pristine elegance! 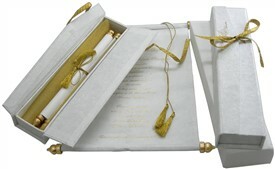 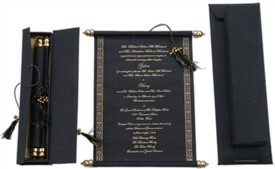 This box scroll card is the example to follow if you need to send an invitation with an impact. 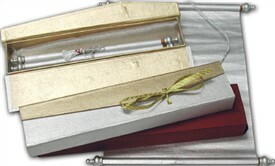 The scroll card is in purple handmade silk paper sheet, there are silver design bars framing it and is tied by a silver tassel. 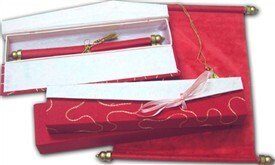 The scroll card is placed above a satin gauze cloth and is encased in a beautifully designed purple handmade silk paper and silver textured sheet combination box which has been further beautified by exotic silver zari embroidery work. 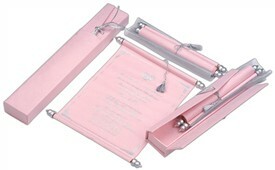 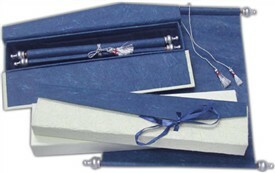 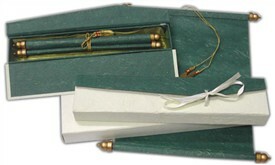 A silver zari ribbon ties the box case.